Have a favorite restaurant or bar you love in Canton? Each wood panel is hand-painted on by Artist Linda Amtmann. These are painted on tongue & grove floor boards. Collect more than one and they interlock to create your own neighborhood. We have many favorite places throughout the Canton neighborhood. Each wood panel is sold individually. 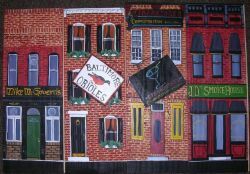 Hand Painted Canton Rowhouse wood panels are available in various choices including 2910 on the Square, Americana Bar, Annabel Lee Tavern, Baltimore Taphouse, Canton Pretzel Shop, Cardinal Tavern, Chesapeake Wine Company, Claddagh Pub, Coburn's, Cosmopolitan, Fin's Restaurant, Fire House Coffee Company, Geckos, The Gin Mill, Helen's Garden, Huson Street Stackhouse, Jack's Bistro, JD's Smokehouse, John's Carry Out, The Laughing Pint, Lee's Pint & Shell, Looney's, Mahaffey's Pub, Mama's on the Half Shell, Mike McGovern's, Nacho Mama's (white) Pickled Parrot, Plug Ugly's Publick House, Saute Restaurant & Bar, Sharkey's, Southern Provisions, Speakeasy, Vaccaro's Italian Pastries, and Yellow Dog Tavern. Choose from 2910 on the Square, Americana Bar, Annabel Lee Tavern, Baltimore Taphouse, Canton Pretzel Shop, Chesapeake Wine Company, Claddagh Pub, Coburns, Cosmopolitan, Fin's Restaurant, Fire House Coffee Company, The Gin Mill, Helens Garden, Jacks Bistro, JDs Smokehouse, Johns Carry Out, Lee's Pint & Shell, Looneys, Mahaffey's Pub, Mamas on the Half Shell, Mike McGovern's, Nacho Mamas, Pickled Parrot, Sharkeys, Speakeasy, and Yellow Dog Tavern. - Canton - Chesapeake Wine Co.
- Canton - Fire House Coffee Co.